Meet the new original ASUS graphics card of mid-range with the high frequencies and a proprietary cooling system. Compare the new “owl” with the most relevant competitors from AMD’s lineup. Almost simultaneously with the official announcement of the GPU AMD Antigua XT with GCN 1.2 architecture and video card Radeon R9 380X built on its base at the end of November last year the company launched its original version of this model. Among them, is ASUSTeK Computer Inc., to submit to the court of the users their version of the user graphics card – ASUS STRIX R9 380X Gaming (STRIX-R9380X-OC4G-GAMING). By design, all ASUS graphics cards of STRIX series with two fans on the cooler are similar to each other as two peas. For example, ASUS STRIX R9 380X Gaming on the front side does not differ from ASUS STRIX GTX 950 OC – all the same plastic cover stylized with owl head with scarlet accents in the center and on the rotors of fans. 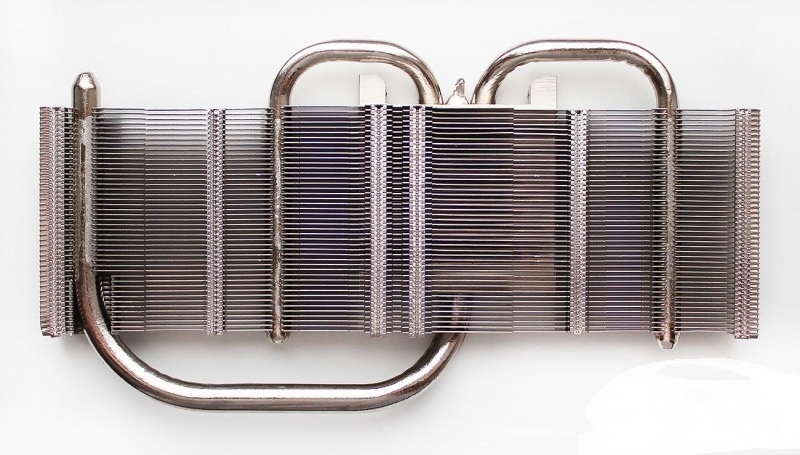 Rear mounted aluminum plate with the name of the manufacturer and the cooling system. Level of video card power consumption stated in the specifications is 190 watts, and the recommended power supply unit for a system with a single graphics card should be at least 500 watts. The cooling system is attached with four screws on the perimeter of the graphics processor. After removing it, you can explore the PCB. Elementary base of the graphics card is based on proprietary technology Super Alloy Power with high quality and durable components. According to the ASUS, thanks to the Super Alloy Power, they managed to increase productivity by 15% – up to 35 degrees Celsius lower temperature and a 2.5-fold increase in service life of the graphics card. Elements of the GPU power are grouped in the area between the video outputs and the GPU, and the six-phase power circuit itself. ASUS STRIX R9 380X Gaming is equipped with 28-nm GPU AMD Antigua XT chip with approximately 366 mm2, containing more than 5 billion transistors. The GPU includes 2048 stream processors and 128 texture units. This is 14.3% more than the Radeon R9 380 without «X», and exactly the same as it was at the Radeon R9 280X, and even earlier in Radeon HD 7970, released in late 2011. The number of ROP units is 32. In other words – yes, full Antigua/Tonga received a higher frequency, defined in terms of optimization of energy consumption and nominal support for DirectX 12, but, frankly speaking, it’s still the same good old Tahiti from five years ago at a reduced to an average value class. Let’s add that the video card’s ASUS GPU frequency in 3D-mode is 1030 MHz (standard models – 970 MHz), and if you activate the OC Mode through a proprietary utility ASUS GPU Tweak II, it increased by another 20 MHz. In the 2D-mode, the frequency is lowered to 300 MHz. On ASUS STRIX R9 380X Gaming are eight standard GDDR5 memory chips with total volume of 4 GB. They are produced by Elpida (by the way, its products are increasingly found on video cards) and are marked W4032BABG-60-F.